I spent St. Patrick’s Day night at the most fun, arty, happening event, (although it had nothing to do with that special day,) and loved it! It was in the Downtown Arts District, (that I’ve been to a lot recently,) and I think every hipster in L.A. was in attendance! 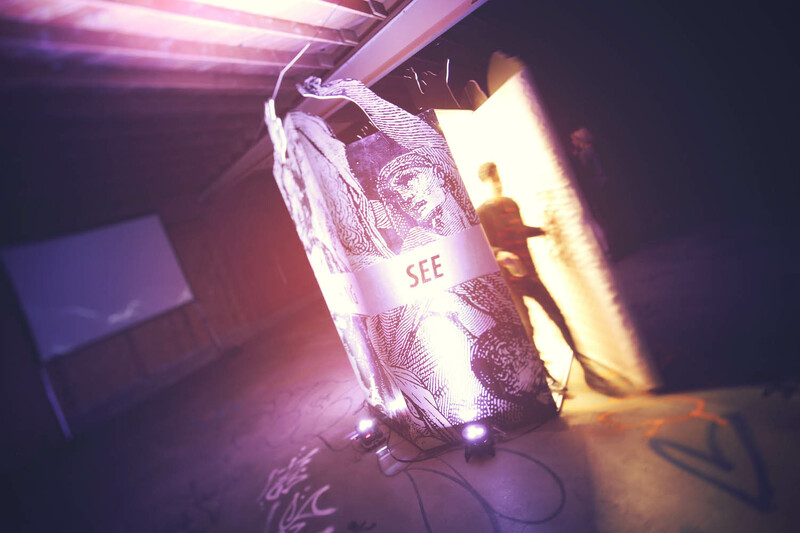 It was held in the humongous Container Yard, and was for the purpose of celebrating street art. I was happy to see so many Angelenos caring about this non-traditional genre. Inside the venue, there was a wall of creations from around the world, captured by technology, which is such a wonderful way to preserve street art. The head of the Google Art Project, Amit Sood, put it best: “When the street is your canvas, the world becomes a gallery for everyone to enjoy. Technology provides a way to preserve these ephemeral artworks and make them available anywhere and anytime.” Amen to that, bro! Digression from the event deets for one of my famous (or annoying) personal stories: Years ago, before the prevalent use of technology, a pal of mind was tearing down her house to build a new one. She invited her kids’ friends, (and me, of course, being the biggest kid they knew,) to paint on the exterior. 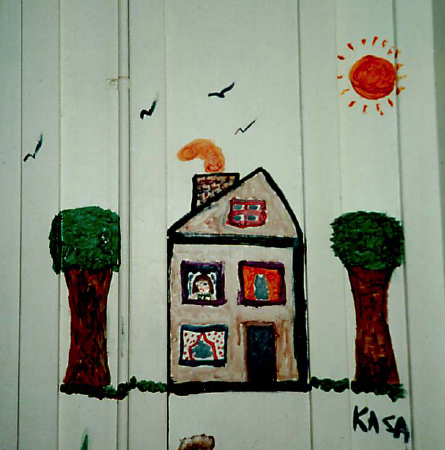 I painted my signature “house with a girl waiting in the window,” that I’ve been drawing since I first held a crayon. I gave it a little something extra, to entertain the kids. And it turned-out to be beautiful, if I do say so myself. Everyone made a giant fuss over it, so much so that I hated that it was about to be destroyed. At least I got to take an analog picture (remember those?,) of it. But just one. Not the hundred digital ones that I would have taken today! A couple of months later, the fam called and told me to come over; they had a surprise for me. When their house was razed, they had my masterpiece cut-out and preserved! OMG! Just as I was getting choked-up by their kindness, they told me they did it for them to keep, not to give to me!!! I’m still appalled that my now-former friends did that!!! 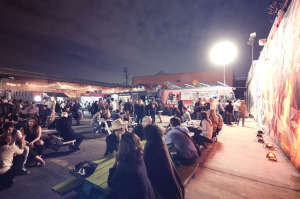 The outdoor food truck scene. How gorgoeus is this photo?! Photo by Andre Niesing. That story was to let you know how behind the saving of street art I am. I needed Google to be in existence back then, to help preserve mine. So, back to the launch soiree. 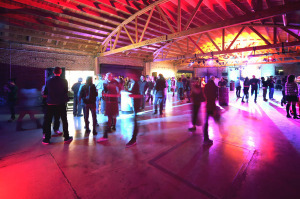 The warehouse space opened into an even bigger outdoor yard adorned with–you guessed it–street art murals. There were picnic tables on which to eat…the food truck fare! Have I mentioned OMG?! I love food trucks!!! This is the “scream booth,” with the big screen behind it. It looks a little like E.T in there, doesn’t it? Photo by Andre Niesing. When we finished chowing down, we made it back inside to mingle and explore. There was one interesting art installation towards the back. It was a hexagonal soundproof structure. We were invited to enter, one at a time, and talk, sing, scream, or make whatever sounds we wanted to. No one could hear us on the outside, but the sounds manifested in digital waves on a giant screen in the spacious room. The small problem with it is that we couldn’t see our own waves, (unless, like me, you were smart enough to have a pal film them.) And…we on the outside could hear some of the people inside! When my pal was screaming, we could all hear her, prompting some observers to wonder, “Isn’t it supposed to be soundproof?” But it was fun, anyway, because that mirth brought us all together. 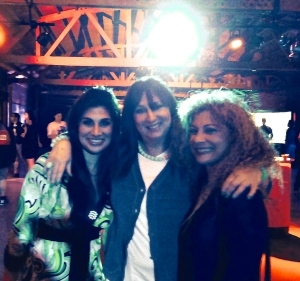 The happy trio of (from L to R) Ali Farinas, Karen Salkin, Nicole Foos. (Is that a halo of Karen’s head?) Photo by a kind stranger. Between that fun, the food, the artwork, and a happening female DJ entertaining the many interesting revelers, how could anyone have not enjoyed themselves??? This fete was a winner! I did make one sad observation, though, which I wish I hadn’t. I was crushed to see how many smokers there still are! How can people be so stupid?! I’d say that almost half of the outdoor guests were smoking. With all the information out there about what a painful death they should expect, who would be stupid enough to choose this filthy, lethal habit??? I was floored to discover it. Yeah, that looks like a halo!